Well, Being a Windows user has so many advantages but at the same time, Windows comes with plenty of annoying errors too. So if you are one of us, then you might have faced DPC_WATCHDOG_VIOLATION error that usually comes whenever you update the Windows 10 latest version on your PC. Well, sharing this fixing guide on DPC_WATCHDOG_VIOLATION, first we should understand about this error, so we can fix it without any big hassle. So, DPC_WATCHDOG_VIOLATION error is one of the most frustrated and annoying error that only comes in Windows 10 operating system based PCs. In this situation, you want to Fix DPC WATCHDOG VIOLATION Windows 10 error so that you will not face this annoying error next time called (Bluescreen Error DPC Watchdog Violation error). This DPC_WATCHDOG_VIOLATION error often occurs with plenty of situations like Frozen Mouse Pointer or with the failure of the program being launched on your Window 10 PC whenever you upgrade it to the latest version. This error is known as the system crash or blue screen of death commonly called as BSOD that is surely very troublesome for all Windows 10 users. WATCHDOG VIOLATION Blue Screen in Windows 10 results with different factors such as your hardware is incompatible, faulty drivers or there are some unusual corrupted system files. 1 What is DPC_WATCHDOG_VIOLATION Error? 1.3 How to Fix DPC_WATCHDOG_VIOLATION error? 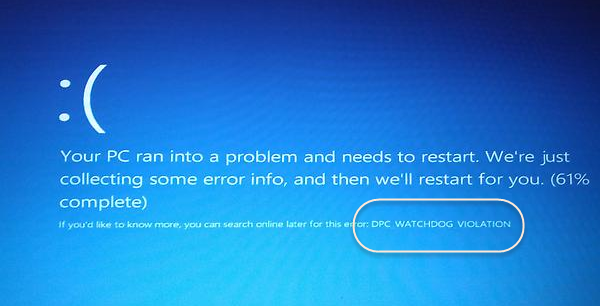 You might don’t know what is DPC_WATCHDOG_VIOLATION error, but it is a very common error message that pop-ups in the Windows system especially in Windows 10 if the SSD Drive of your system is corrupted or didn’t updated with the latest version. Hence, it is an error encountered in your hardware components that create an issue that makes you look for how to fix DPC_WATCHDOG_VIOLATION Windows 10. Apart from this, you can also see this issue of DPC watchdog violation at the time when you boot your system. After, when you install the new hardware and software, it is one of the most important thing is that you may come across the death of blue screen error. Well here are few symptoms enlisted that is you can keep track of blue screen error. DPC_WATCHDOG_VIOLATION error appears it when crashes the active program in Windows 10. Sometimes “STOP Error 0x133: DPC_WATCHDOG_VIOLATION” also comes on screen. Windows gets shut down because of some issue to prevent the damage to your PC. This error 0x133 frequently comes with the crashing of Windows during running the same program. “The DPC_WATCHDOG_VIOLATION” error check has a value of 0x00000133 that indicates that DPC watchdog is executed due to come prolonged problem in your PC. Windows is running sluggishly and response to mouse or keyboard input is very slow. The system Freezes periodically for few seconds at a single time. If you configured old and corrupted drivers incorrectly. Windows registry is corrupted due to recent software update. Corrupted Windows OS files due to malware or some unwanted viruses. After when you have installed software or drivers related to Windows Operating system, and there are some damaged or removed system files. DPC_WATCHDOG_VIOLATION STOP error may occur due to memory corruption. So now you have complete information about what is “DPC_WATCHDOG_VIOLATION” and Blue screen death error and the first thing you will want to look for the fixing guide for this error and while talking about Fix DPC WATCHDOG VIOLATION Error. So here we are going to share the complete step by step guide that will fix your BSOD issue and will get back your PC in a perfect condition. First, go to Start Button and choose Control Panel and in the control panel select Power Options. Now from the left side of the panel, select what the power button does. Now choose Change Settings that unavailable from the Window that opens. Now scroll down a little and you will find Turn On fast startup option. Uncheck this option to turn it off. Then click on Save Changes and Exit to save the changes. A Window will open asking for administrator permission just taps on YES. A command window will open, type in the box the command as chkdsk c: /f /r. Hit the enter button. The type Y so that you check it again when you next start the PC. Now reboot the computer so that Windows may check for hard disk. To begin with go to Device Manager. Locate the option and expand IDE ATA/ATAPI controllers. Then right click the controller option that carries the name SATA ACHI in it and chooses Properties. You must verify that you have chosen the right controller. For this go to Driver and tap on the details option. Search for the driver listed as iaStorA.sys. Then click on OK button to exit. Go back to properties window and then understand driver tab chose to update driver. Then choose the option Browse my computer for drive software. Then choose let me pick from a list of device drivers on my computer. Look for Standard SATA AHCI Controller from the list and choose it. Then press NEXT to continue and complete the rest of the procedure as instructed. To let all the changes take place you need to restart your PC. If in case you’re Windows or system does not find the driver that is needed or is correct one then you can take the help of Driver Easy that is capable of detecting, downloading and installing the correct drives needed. We hope you find this post on DPC_WATCHDOG_VIOLATION error useful and helpful to resolve this Blue Screen of Death error. If you have any query then please drop your queries in the comment section below.